The following graphic illustrates a typical deployment for AI Suite. The following sections describe the elements involved in a typical AI Suite deployment. The Intranet is a private network only accessible to organization staff. It is protected against unauthorized access with security systems such as firewalls. Caution AI Suite applications should be deployed on servers in the company Intranet as internal applications that are not accessible from Internet. Additional security measures must be taken if AI Suite applications are deployed on servers accessible from Internet. Application servers are computers where the AI Suite Web application server and AI Suite command line tools are installed and run. Apache Tomcat server is preconfigured and delivered in AI Suite Infrastructure. 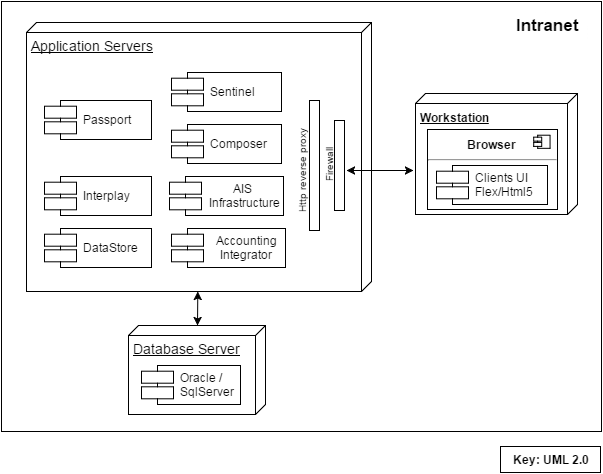 The AI Suite Web applications that run inside the Apache Tomcat server are: Administration, Report Server, Designer, InterPlay, Datastore, Sentinel and AI Suite Studio. Except Sentinel that needs its own instance, these applications , can all run inside one instance of Tomcat or can be grouped in several instances of Tomcat. It is recommended to use one Tomcat instance forAI Suite Infrastructure applications (Designer, Administration and Report Server) and one instance for each AI Suite component (InterPlay, Datastore, AI Suite Studio). Other applications such as Rule Engine Server, PassPort and Composer, use embedded Jetty web server. For more information regarding recommended hardware depending on the configuration and data processed, see the Datastore Capacity Planning Guide. Flex or HTML5 UI applications accessible through a browser (Chrome, Firefox, Internet Explorer) from a user workstation (where the browser usually runs inside Intranet) and connected over HTTPS (AMF or JSON) to AIS application servers via a gateway (firewall and reverse proxy). The network connection between an application server and a database server should have a low latency. You can find a list of the recommended hardware for database application servers and network connections in the vendor-specific documentation and in the Datastore Capacity Planning Guide.